Yesterday, March 14th, the Revolutionary Communist Party (RCP) was forcibly evicted from the San Francisco Anarchist Book Fair. Surprisingly some “Anarchists” have criticized the move and have even defended the Maoist’s right to free speech. 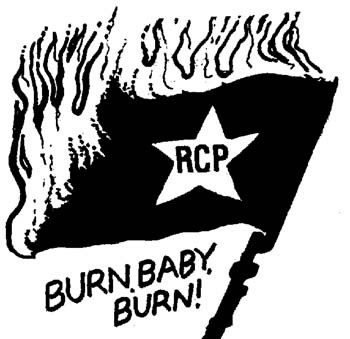 These Anarcho-Liberals have gone as far as to suggest that throwing water on the RCP’s literature is violence. Soon after the incident, the RCP started a petition denouncing their eviction. 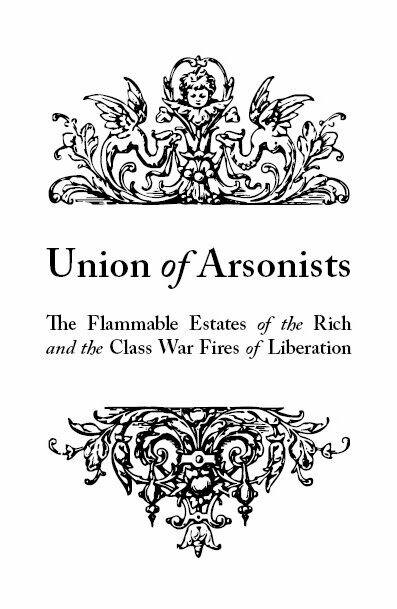 Dozens of so-called “Anarchists” signed the petition. These Bash Back!ers think the petition is a fantastic idea, and we want to thank those who signed the petition of a historically heterosexist organization. Now we know whose side you all are really on. South Carolina has long been a fertile ground for recruiters, its 10.4 percent jobless rate — second-highest in the nation — appears to be prompting even more people to visit or give the Army a call. Through the first five months of the 2009 fiscal year, which began Oct. 1, the number of troops signed by the Army’s Columbia Recruiting Battalion was up 17 percent compared to a similar period in 2008. By the way, the jobless rate in South Carolina in 2008 was 6.9 percent. I've obtained the documents the MCSO was so hot to have Maria del Carmen Garcia-Martinez mark with her fingerprint. You can see them for yourself, here. Initially, I believed that there was just one page, but now I see there are four pag es that the MCSO had Garcia-Martinez put her fingerprint on. Garcia-Martinez, who cannot read or speak English, believed the paperwork was a voluntary removal form to send her back to Mexico, and so refused to cooperate. She relented after six MCSO guards broke her arm, and left her in a room for several hours. When eight MCSO returned later that night and told her to give up her fingerprint or else, she allowed them to put her finger on the documents. 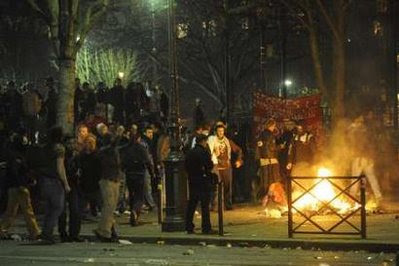 Schools, courts, post offices, universities and hospitals were closed, with public transport severely disrupted, as up to 200 marches were organised against President Nicolas Sarkozy's approach to the global downturn. The biggest protests were in Paris, where police said up to 85,000 people took five hours to walk from Place de la République to Place de la Nation. As the light faded, hundreds of riot police were sent to the area where anarchist groups waving revolutionary flags were among those massing. Riot police fired rounds of tear gas after demonstrators lit fires and smashed shop windows. Fighting broke out on all corners of the square, with police moving in to try to arrest ring leaders. James Hansen, a climate modeller with Nasa, told the Guardian today that corporate lobbying has undermined democratic attempts to curb carbon pollution. "The democratic process doesn't quite seem to be working," he said. Speaking on the eve of joining a protest against the headquarters of power firm E.ON in Coventry, Hansen said: "The first action that people should take is to use the democratic process. What is frustrating people, me included, is that democratic action affects elections but what we get then from political leaders is greenwash. 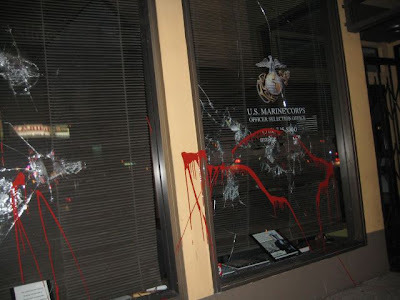 The United States Marine Corps Officer Selection Office in downtown Berkeley came under attack once again Wednesday night when a group of vandals broke the building’s windows with sledgehammers and splashed them with red paint. Officers at the recruiting center at 64 Shattuck Square were not able to say whether the incident was related to protests taking place throughout the rest of the country on the eve of the sixth anniversary of the Iraq war. Berkeley Police Department spokesperson Officer Andrew Frankel said the police received a call at 8:54 p.m. Wednesday from an eyewitness who reported that three suspects were breaking the Marine Corps office’s plate-glass windows and splashing them with red paint.